About the author | ¡La Vida Es Rica! ~ Life is Delicious! What about me, author of this blog which is All About Me? I was born in Oklahoma and raised on a farm, got several degrees along with a divorce from my high school boyfriend (who, I discovered, loved my father’s land more than he loved me), and moved to teach at the University of South Carolina in Columbia where I met and married the father of my two magnificent daughters. After we divorced, I married a wonderful man in Colorado who had seven children who were all about my age. He transitioned in 2009, and I moved full-time to Puerto Morelos, Mexico, where I was happy living as an unencumbered single woman in a beachside paradise. 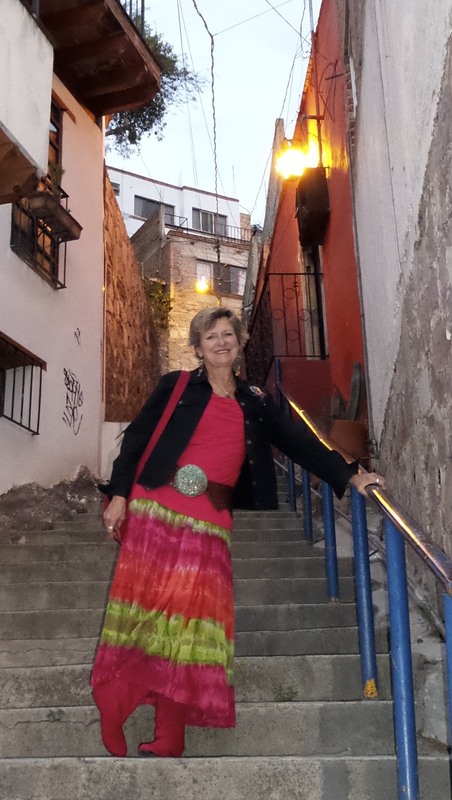 Happy attracts happy – and there I met another wonderful person with whom I now share my life in Guanajuato, the Sierra Madre mountains of Central Mexico. Back in the ‘70s, I authored the textbook, A Blueprint for Yearbooks Today, used in high schools and universities throughout the United States. Other dubious acknowledgements include being named Fifth Grade Poppy Queen by the local chapter of the American Legion; that title was assumed to be revoked when, as a high school teacher, I was black-listed by that same chapter. I was also Queen of the Kansas Spring Barrow Show (awarding ribbons to winning oinkers), Blackwell High School Salutatorian, Oklahoma Dairy Princess and first-runner-up to American Dairy Princess(serving milk to then-Senator Richard Nixon), and (voted by my two daughters) The Best Mom I’ve Ever Had. I have a BS in English, an MS in journalism, and an EdD in communications/educational development from Oklahoma State University. After a nearly 25-year career owning a business which specialized in organizing people and events, writing and editing technical documents, and smoozing — I now enjoy writing, photography, travel, and life in general. Embrace the Ordinary, Reveal its Magic. Great blog, Mary! You really communicate the Puerto Morelos (and Mary Jordan) vibe. Greetings Mary! Love the blog – great start. Would love to exchange the weather. Students have been out of school almost two full weeks. Mmm…Mmmm…. I am now hungry! Hungry to share a laugh with you in person and take in all the beauty that surrounds you. Enjoy enjoy enjoy my friend. Think I will go have some bacon and eggs…. and toast to you across the miles. Happy Birthday Mary — two days early of course but since travelling thought I best extend my happy wishes now! Hi Mary!! I love your blog! Out of the 4 of us, I miss Puerto Morelos the most! Thank you again for working on Aidan’s stiff neck. It seems to have abated after that and now it is completely gone and we have not even gone to the chiropractor. I wanted to send you our photos in Terraza’s during our last night there. If you are in FB, you can friend me and see all the PM photos i posted in 2 albums. You can search me in FB – Leni Santiago-Pratte. Or email me so i can send it via email. Hope you are well! Wish i was there still! Love your blog, “M.J.” Your spirit matches that of Puerto Morelos. How wonderful to have a special on-going love affair with a special place that has quite obviously captured your heart! I also have a passion for food, and are my way around P.M. last week.Your blog is great Mary for a short while I was at Ed’s ,in Colonia and all the other wonderful places they have. It was my 3rd visit in 2 years ,how I wish I could spend more time, Looking forward to reading your next edition. flavor does not last as long because yours, which are sweeter tasting. I just found your site and wanted to ask if you would be interested in providing a guest post for our site Retirement And Good Living (http://retirementandgoodliving.com) about living in Mexico. Please send me an email if interested and I will forward additional information. Love your blog, Mary! I do some food writing, too, mostly on Facebook or Instagram, from my home of 7 years in San Miguel de Allende. Please look me up next time you’re in the vecindario!